The Donation of Franciszka Wyczółkowska to Bydgoszcz City Township. Professor Leon Wyczółkowski, one of the most outstanding masters of painting and graphic art, died at the age of 85, on December 27, 1936, in Warsaw. He left a huge collection of artworks, consisting of paintings, graphic art and a significant number of drawings. One can say that Wyczółkowski had ties with the Municipal Museum of Bydgoszcz from the origins of this institution, which has been operating in its present shape since 1923. Residents had another opportunity to view the works made by Wyczółkowski at the Exhibition of Acquisitions of the Municipal Museum, organized in 1928. It was followed by a 1934 monographic exhibition dedicated to the work of this outstanding master of Polish painting and graphic art. in 1936, the gallery of paintings made by Polish artists of the 19th and 20th centuries in the Municipal Museum presented the following works in three separate rooms: room no. 1 – works of Bydgoszcz native Maksymilian Antoni Piotrowski, room no. 2 – works of Bydgoszcz artists, room no. 3 – works of Leon Wyczółkowski. It’s hard not to notice the rightness of the previous statement, namely that Wyczółkowski’s artistic activity was highly regarded by both the municipal authorities and the local community. The reason for this should be seen in the theme of his works – views of local nature of the Tuchola Forest so close to the heart. Based on the donation made in 1937 by the late artist’s wife, Franciszka Wyczółkowska, the collection of the Municipal Museum of Bydgoszcz was enlarged by paintings, graphic artworks, partially filled sketchbooks, equipment from his studio, including the press, palettes, easels as well as documents and photographs, and personal memorabilia. According to the daily Dziennik Ostrowski, in February 1937, Wyczółkowska sent a letter to the Mayor of Bydgoszcz, Leon Barciszewski, in which she notified him about her will to donate to the city the works and collections left by her late husband. That gesture was supposed to serve as foundation for building an eternal art monument to the Artist. Altogether there were 942 works. This number was also shown in the report on the activity of the Municipal Board of the city of Bydgoszcz for the term between January 1, 1934 and December 31, 1938. Due to the fact that the majority of Wyczółkowski’s works was unsigned, a special committee comprising Polish artists was supposed to be appointed in order to confirm the authenticity of the works. The main emphasis was placed on drawings and sketches. On May 22, 1937, Mayor Barciszewski received a protocol confirming authenticity of Wyczółkowski’s works, acknowledging that 700 works had undergone verification. The process did not include artworks displayed at the exhibition at that time and other works stored in Gościeradz. Representatives of the Academy of Fine Arts also suggested compiling a catalog of Wyczółkowski’s works with the help of engineer Kazimierz Szulisławski, prepared according to uniform numbering. An additional aspect of this popularly called “royal gift” was transfer of his copyrights with all licenses to Bydgoszcz City Township. The value of these rights was estimated at Zl 2,000. For this purpose, a special contract was drafted, which was signed on June 11, 1937. In addition, Bydgoszcz City was obligated to pay to Franciszka Wyczółkowska all profits resulting from lending works made by Wyczółkowski. In accordance with the will of the benefactor, Leon Wyczółkowski’s legacy remained intact and presently, it is placed in a separate department of the Museum – the Leon Wyczółkowski Department. Thanks to revitalization of the Młyńska Island and donation of the building on 7 Mennica Street for the mentioned needs, it is possible to display a considerable part of Leon Wyczółkowski’s legacy gifted to Bydgoszcz City Township. The current requirements facing museum institutions regarding protection and assurance of safety to collections as well as their proper displaying, along with the museum movement, which contributes to popularization of artist’s activity make that the present permanent exhibition undergoes temporary changes. In order to provide proper care and rooms to artworks, make them available so they can serve as a source of education and inspiration to future generations, according to the will of Franciszka Wyczółkowska, the mentioned goals were supposed to be fulfilled through activity of the so-called trust, consisting of every Director of the National Museum of Krakow, Director of the National Museum of Warsaw, Head of the Department of Culture and Arts of the Ministry of Religious Denominations and Public Enlightenment, Bydgoszcz Fara Church Parish Priest, Representative of the Bydgoszcz Municipal Council, Chairman of the Artistic-Cultural Council (RAK) in Bydgoszcz, and in the case of its dissolution - chairman of an association in Bydgoszcz with the same of similar competencies, District Court Chairman in Bydgoszcz, Franciszka Wyczółkowska, professor’s wife for life, forester Kazimierz Szulisławski, and retired Major Kazimierz Południowski, member of RAK. The trust, mentioned in the deed of donation, has never been established, whereas Bydgoszcz City Township operating through the City Board represented by Mayor Leon Barciszewski and Deputy Mayor Marcin Śpikowski accepting the donation, promised to provide to the works and collections proper care, making sure that they will constitute a national monument of the immortal work of Leon Wyczółkowski. The City Board entrusted the donated collections to the care of the Municipal Museum, a unit in official structures, which was administered by the Municipal Museum Office, subordinate to the Municipal Office. The mentioned body managing the Museum consisted of 12 members: 3 members of the Municipal Office including the manager of the Municipal Museum serving also as the chairman of the Municipal Museum Office, 5 members of the City Council and 4 civilian members. In accordance with the regulations of the Municipal Museum Office, the person managing the institution was its manager. This function was performed for many years by city councilor Tadeusz Janicki. The Museum personnel was subordinated directly to the manager; in case of his longer absence, resulting from sickness or other reasons not allowing for proper fulfillment of manager’s duties, his deputy was appointed by the mayor from among members of the municipal office, comprising the Municipal Museum Office. Some of the main activities of the Municipal Museum Office included: proper supervision over all material resources owned by the Museum on behalf of Bydgoszcz City Township, issuance of opinions regarding their proper maintenance within the budget, studying and evaluating all historical artworks and masterpieces submitted for acquisition, annual preparation of the budget and report from activity of the Museum. In the case of donations to Bydgoszcz City Township, added to the collections of the Municipal Museum, the decisive role was played by the City Council, which accepted the donation and confirmed it by a resolution. Such event took place in the case of the donation made by Prof. Konstanty Laszczka and Kazimierz Kierski, Chairman of the General Prosecutor’s Office in Poznań. Confirmation of the donation took place based on resolutions dated June 16, 1937. It is believed that the same procedure applied to the confirmation and donation made by Franciszka Wyczółkowska. Unfortunately, we can only refer to the mentioned analogy due to a similar period of the mentioned donations. Documents of the National Archives of Bydgoszcz do not contain protocols from the period, during which the donation of Mrs. Wyczółkowska was made. We assume that the councilors approved such resolution on April 6, 1937. 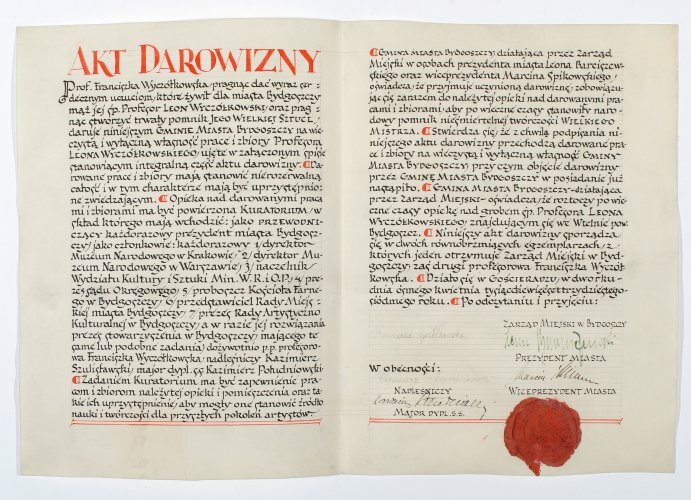 The Museum has a letter written by Aleksander Trzciński from the Poznań Regional Office to the Municipal Office of Bydgoszcz confirming the resolution regarding the takeover of the donation made by Franciszka Wyczółkowska. April 10, 1937 marked the beginning of a two-day celebration commemorating the late Leon Wyczółkowski. The celebration was preceded by Holy Mass said in the Fara Parish Church by the Rev. Canon Józef Schultz, attended by Franciszka Wyczółkowska, representatives of the authorities and offices as well as a big group of artists and friends. In the late evening, the building of the Bydgoszcz Municipal Theater hosted a solemn celebration in memory of Leon Wyczółkowski. It was also a celebration of gratitude for the donation made by the artist’s wife, who gave to the city of Bydgoszcz some of the legacy that remained in Gościeradz after her late husband. The celebration was attended by representatives of the state authorities, including the Government of Poland and Minister Świętosławski, Patron of the Celebration, Władysław Zawistowski, Head of the Department of Culture and Arts of the Ministry of Religious Denominations and Public Enlightenment, representatives of the municipal authorities and local government, led by Leon Barciszewski, Mayor of Bydgoszcz and Julian Suski, County Commissioner; military representatives: Gen. Wiktor Thommée, Commander of the 8th Corps District in Toruń, Gen. Jan Chmurowicz, Division Commander, and museum authorities, including Dr. Feliks Kopera, Director of the National Museum in Krakow. The group of guests also included representatives and delegates of university authorities, professors, friends and students of Leon Wyczółkowski. On the second day of celebration – April 11, 1937 – the participants went to Gościeradz, in order to visit the place, where the most beautiful paintings and graphic works related to the Bydgoszcz area and the Tuchola Forest were made. En route, they stopped in the Wtelno cemetery, where Leon Wyczółkowski was laid to rest. The opening of the posthumous exhibition dedicated to the artist took place at noon. Due to an insufficient area of the Municipal Museum, which had a small exhibition room, only some works representing the artist’s legacy donated by Franciszka Wyczółkowska to the city were displayed. The collections of the Leon Wyczółkowski Regional Museum in Bydgoszcz feature a preserved list of works that were selected for the exhibition, as well as notes taken by engineer Kazimierz Szulisławski operating with the approval of Franciszka Wyczółkowska and Kazimierz Borucki, Deputy Curator of the Museum, confirming their close cooperation regarding selection of works for the planned exhibition. In addition to officials, who participated in the celebrations, the opening of the exhibition was attended by Poznań Governor Artur Maruszewski. In his speech, he was highlighting the immeasurable achievements of Wyczółkowski for the Polish culture, popularization of our Homeland’s scenery and also the tragic history of many generations of Poles fighting for the liberation of our nation. After that, he decorated Franciszka Wyczółkowska with the mentioned Gold Cross of Merit. After the official part, those gathered moved to the Municipal Museum, where at the request of the Mayor of Bydgoszcz, Governor Maruszewski cut the ribbon, opening officially the exhibition dedicated to the work of Leon Wyczółkowski. In the same time, remodeling works continued on the building of the former Borderland Dormitory on 8 Pierackiego Street (today, Karola Chodkiewicza Street), which was planned for the opening of the exhibition dedicated to the donation made by Franciszka Wyczółkowska. On June 16, 1937, the City Council made the decision to take a loan amounting to 16,300 zlotys for remodeling purposes in order to organize an exhibition, which opening was planned for July 4th of that year. Employees of the Museum had taken an active part in preparation of the exhibition, in particular Deputy Curator Kazimierz Borucki, who was bringing from Gościeradz works and memorabilia of Leon Wyczółkowski. He was also involved in their maintenance, supervising bookbinding and woodworking works. In order to publish a special catalog, Borucki was also describing techniques of individual works and their dimensions. The solemn opening of the exhibition took place on July 4, 1937. It featured the legacy of the late Leon Wyczółkowski and gifts donated to the city of Bydgoszcz by Prof. Konstanty Laszczka in the form of twelve sculptures, representing his work as well as documents gifted by Kazimierz Kierski to the Municipal Library. The exhibition was opened by Mayor of Bydgoszcz Leon Barciszewski in the former Borderland Dormitory building, adjusted for the exhibition purposes. The celebration was also attended by Franciszka Wyczółkowska, who cut the ribbon, opening officially the exhibition, which was originally estimated to be opened to the public for three months. The exhibition was opened twice a week – on Sundays and Wednesdays. Initially, it was supposed to end on November 15, 1937, but because of its popularity among visitors, it was extended until June 1938. As results from analyzed documents, the exhibition was seen by 5,641 people. The previous most popular event was the exhibition commemorating Marshal Piłsudski, which was visited by 9,252 people. The exhibition was accompanied by the Catalog of Gifts Donated by Prof. Leon Wyczółkowski’s Wife, Prof. Konstanty Laszczka and Chairman Kazimierz Kierski, which in addition to works coming from the donation made by Franciszka Wyczółkowska, contained also exhibits and documents received from the mentioned benefactors. The main reason for closing the mentioned exhibition were the poor conditions for displaying artworks, which were known from the letter directed to the future Director of the Municipal Museum, Dr. Edward Łepkowski, art historian and experienced museologist. As we read in the letter “the exhibition of the gifts left by the late Leon Wyczółkowski has to be secured immediately, since the cold temperature on the premises can have a negative impact on the preservation condition of pastels and graphic art.” Therefore, we can notice that the obligation made by Bydgoszcz City Township regarding proper care given to the works and collections donated by Franciszka Wyczółkowska and the opinion of Dr. Edward Łepkowski led to the closing of the exhibition in June 1938. According to the inventory of deposits preserved by the Regional Museum, the collection of works made by Leon Wyczółkowski was expanded by the donation made by Franciszka Wyczółkowska to the Municipal Museum on August 16, 1939. It consisted of 38 works, including 35 made by the Master. The remaining three included Prof. Leon Wyczółkowski at Work – in the Garden made by Józef Pieniążek, Flowers made by Franciszka Wyczółkowska, and Portrait of Leon Wyczółkowski made by Walery Gadomski. This fact is additionally acknowledged by a letter written by Kazimierz Borucki addressed to Wyczółkowska, confirming the takeover of the donation. The donation made by Franciszka Wyczółkowska had significantly expanded the Bydgoszcz art collection. The municipal authorities initiated efforts to acquire a new building for the Municipal Museum, which were interrupted by World War II. As early as August 1939, works started on packing artworks collected in the Bydgoszcz Museum. Some works of Wyczółkowski were packed to three boxes and along with other cultural properties (altogether 6 boxes) were transported to a basement of a building situated on 5 Szwedzka Street (today, Podgórna Street), owned by carpentry master Jakub Hechliński. On November 4, 1939, after the capture of Bydgoszcz by the occupying forces, Kazimierz Borucki was delegated to pick up these boxes. They were supposed to be brought back to the Museum building. During that time, Prof. Willi Drost, PhD of Gdańsk supervised the Museum, which was managed by appointment by Kurt Skonietzki, a teacher in the Albrecht Dürer School. Only in 1940, Dr. Konrad Kothe was appointed director of the Museum. Since 1921, he was a member of the Historical Society of the Noteć District, operating in Bydgoszcz before the foundation of the Municipal Museum. In the spring of 1940, after demolition of the western frontage of the Old Market Square by the Germans, the museum collections were moved to the Lombard building on Löwenstrasse (today, Pocztowa Street). The artworks were returned on July 19, 1940. Wyczółkowski “St. John’s Church in Toruń (O.360) and Motif from the Park (W.199); on March 29, Apple Trees in Blossom, a lithograph made by Wyczółkowski (W.G.96) were loaned to the Culture Office. palaces, castles and manor houses in areas regarded as relatively safe would be used for this purpose. Germans working in Bydgoszcz selected the following places in the Bydgoszcz area: Dębowo (Dembowo) – Sadki Township, Kawęcin (Kawentschien) – Bukowiec Township, Trzciniec (Schönberg) – Sicienko Township, Piotrkówko (Peterhof) – Sicienko Township, Łochowice (Lochwitz) – Białe Błota Township, Luszkówko (Luschkau) – Pruszcz Township, Morsk (Schlossdorf) – Świecie Township, Mała Komorza (Kleine Komorze) – Tuchola Township, Kiełpin (Kelpenhof) – Tuchola Township, Mąkowarsko (Mönkenwerth) – Koronowo Township, and Pobórka Wielka (Poburken) – Białośliwie Township. From the letter sent on November 10, 1943 to the Mayor of Bydgoszcz by Dr. Kothe we can deduce that 488 paintings were moved as well as 658 archeological artifacts and historical objects, ethnographic and artistic handicraft collections. Below, there is a table presenting quantities of Wyczółkowski’s artworks taken to individual locations. Source: APB, List of movable historical objects (Searching, securing and bringing museum collections as well as lists of losses. Purchase of artworks), sign. 189. Efforts aimed at regaining of artworks that were taken started just after the liberation of Bydgoszcz, which took place on January 20, 1945. In the letter to the Committee for Protection of National and Cultural Property in Bydgoszcz, dated January 31, 1945, Kazimierz Borucki informs about the number of exhibits that were taken. He estimates that 15 trucks would be needed to bring them back to Bydgoszcz. In the letter, he indicates that 175 of Wyczółkowski’s works were taken to Piotrkówko, 61 to Trzciniec, 59 to Dębowo, and 19 to Kawęcin. After analyzing documents containing lists of museum exhibits that were moved away, we can find out that in the case of Piotrkówko and Dębowo the numbers are slightly higher. As we can easily notice, deposits were not included as well. Another letter, addressed to the City Board, is a request for assistance in finding a proper vehicle. On February 4, 1945, an inspection was conducted in Piotrkówko. Museum exhibits found in the estate were in good condition. Despite open boxes and shifting of paintings contained in them, the collections were not damaged. Captain Agrevitch, commander of a Russian troop, who ordered moving of the boxes to the bathroom, showed a particular care in protecting them from unauthorized persons. Trzciniec was a quite different story. Another inspection of that place took place on February 10, 1945. Unfortunately, the manor house in which the boxes brought from Bydgoszcz were placed was destroyed by fire ignited by the Russian army stationing here in January 1945. Since there were no traces or remains, it was believed that all artworks were consumed by fire. However, according to information contained in a note, some witnesses noticed boxes with unknown content that were brought from Bydgoszcz and later taken to some other, unknown destination. Therefore, one can assume that the collections that were allegedly destroyed in Trzciniec did not perish in fire, but were taken away. On May 11, 1945, Kazimierz Borucki asked the Mayor of Bydgoszcz to send him to Pobórka, Dębowo, Mała Komorza, Luszkówko, Mąkowarsko, Łochowice, Trzciniec, Piotrkówko and Kawęcin in order to secure museum objects hidden in these locations. Other employees of the Museum sent to bring the collections back included Jakub Nowicki, Wiktor Mądrowski, Henryk Małolepszy, and Marian Barłożyk. (no titles or authors were mentioned – author’s note), whereas the canvas from Antoni Kozakiewicz’s painting Spoczynek (Rest) was used as a curtain for a smashed window. The delegation also visited nearby houses. It appeared that residents stored some of the paintings, explaining the fact that they were thrown away from the palace by the Russian army. The majority of them were damaged. Kazimierz Borucki, who wrote this note, did not mention any of the works made by Wyczółkowski. It’s hard to determine what the situation was that was found by the commission in Dębowo. Archives do not contain any official notes regarding the inspection conducted on site. According to an analysis of the report concerning war losses prepared by Kazimierz Borucki, 149 Wyczółkowski’s works perished in the turmoil of war, including 10 artworks purchased from the artist and other private individuals, as well as deposits transferred to the Museum by Franciszka Wyczółkowska for safekeeping. The table presented above indicates that 15 works were taken from the deposit (one of them was brought back on behalf of Stadtsparkasse). It is not known what happened with the remaining 21 works donated by Wyczółkowska in August 1939. They included: Prof. Rüdiger Surrounded by Assistants (oil), Studio – and an Empty Armchair (watercolor), Old Manor House (ink), Self-portrait in a Hat (sprinkled), Chełmno – Town Hall (autolithograph), Pear Tree in Blossom (autolithograph), Pear Tree in Blossom (autolithograph), Apple Tree in Blossom (autolithograph), Plum Trees in Blossom (autolithograph), Dead Tree (autolithograph), Dead Tree (autolithograph), Oaks (autolithograph), Tree in Blossom (autolithograph), Flowers (autolithograph), Krakow – St. Mary’s Church (autolithograph), Krakow – St. Mary’s Church (autolithograph), From the Altar Made by Veit Stoss (autolithograph), From the Altar Made by Veit Stoss (autolithograph), Wawel Christ (color autolithograph), Self-portrait (autolithograph), and Christ Adored by Saints (color print). Currently, the Museum works on gathering archival materials in order to explain the mentioned losses. In 1963, Kazimierz Szulisławski became interested in the fate of Wyczółkowski’s works that were not included in the great donation of 1937. He sent a letter to Wyczółkowska’s nephew, Julian Fiut asking him is any of the works made by Leon Wyczółkowski were given to him during the occupation and if he had any information on the furniture and paintings from Wyczółkowska’s apartment in Bydgoszcz. Fiut responded to the letter on July 12, 1963. According to the letter, the only document that he received during the war was the last will of Franciszka. His aunt also informed him about the deposit, sending to him a list of works. He did not know what happened to the furniture and the remaining artworks. In this moment, it’s worth mentioning what happened to the Master’s wife, Franciszka after 1937 until her death in 1943. After transferring the gift, she received the mentioned apartment in the tenement house situated in 2 Wayssenhoffa Square based on the decision of the City Council dated June 16, 1937. However, she was living with her sister and brother in law, Zofia and Jan Pilarczyk, in Gościeradz. After the war, the professor’s wife was in dire straits. According to the letter written by Kurt Skonietzki to the head of civilian administration dated October 14, 1939, Wyczółkowska had no means of livelihood. Franciszka according to her letters. The difficult living conditions of Wyczółkowska were also described in a letter written by Ignacy Trawa, former teacher in the Koronowo Prison to Kazimierz Szulisławski. He mentioned the illnesses plaguing the professor’s wife, food supplies delivered to her from the prison and neighbors. 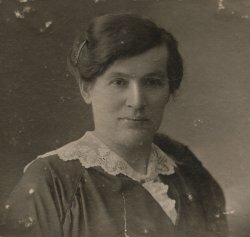 Franciszka Wyczółkowska died on May 1, 1943. The Regional Museum has a copy of her last will, written on April 27, 1937 in the presence of witnesses: Rev. Franciszek Krzywdziński, local farmer Jan Wieczór and forester Henryk Bolcek. 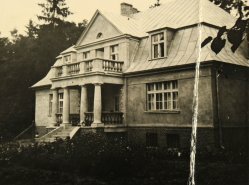 The last will of the professor’s wife was handing over the Gościeradz manor to her nephew Julian Fiut. 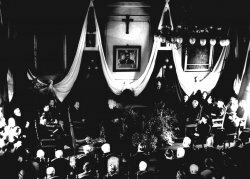 Wyczółkowska’s funeral was very modest, which is understandable taking into consideration the ongoing war. Franciszka’s sister asked the mentioned Ignacy Trawa for assistance in organization of the funeral. He, in turn, asked the prosecutor of the Koronowo Prison to delegate 6 prisoners with a horse cart for this occasion. According to Trawa, the rubber platform was covered with a carpet and flowers, on which the prisoners placed the casket. After that, the funeral procession headed to the Wtelno Cemetery. Franciszka Wyczółkowska was buried in the grave next to her husband. As early as 1937, during the two-day celebration commemorating the great artist, Mayor of Bydgoszcz Leon Barciszewski highlighted that the legacy of Leon Wyczółkowski, containing primarily his paintings and graphic artworks, donated by Franciszka Wyczółkowska is so extensive that it could establish a separate, magnificent museum. (today, 4 Gdańska Street) was designated for museum purposes. In the same time, by the resolution no. 547 it was decided to change the name of Sportowa Street in Bydgoszcz to Leona Wyczółkowskiego Avenue taking into consideration significant accomplishments of the professor. The solemn opening of the Leon Wyczółkowski Municipal Museum in Bydgoszcz, combined with the opening of an exhibition presenting the artist’s works, was carried out by Governor of Pomerania Wojciech Wojewoda. Leon Wyczółkowski’s collection, which was so significantly decreased as a result of the war, was shortly expanded thanks to the donation made by the longtime friend of the Artist, engineer Kazimierz Szulisławski. When asked about the reason of the donation, Szulisławski responded that in this way, he wanted to pay homage to Wyczółkowski. Master’s works deserve to be shown to wide audiences. Szulisławski expressed his will to donate his private collection to the Museum as early as May 1946. He was frequently visited by Kazimierz Borucki, who had measured and appraised all works. On September 3, 1948, the forester donated to the Museum a total of 110 items. They included 32 paintings, 69 drawings, 4 graphic artworks, and 5 sketchbooks. This event was related to the celebration of the 25th anniversary of the Municipal Museum. The ceremony started at 12:30 p.m. in the grand room of the Municipal Museum with choir performance of the “Gaude Mater” song. A large group of guests was welcomed by Henryk Trzebiński, Deputy Governor of Pomerania. It was followed by a speech made by Director of the Museum Kazimierz Borucki, who told about the donated collection. Other speeches were delivered by Witold Kierzkowski, representative of the Ministry of Culture and Art, Józef Twardzicki, Mayor of Bydgoszcz, Prof. Dr. Feliks Kopera, Dr. Witold Bełza, Head of the Municipal Department of Culture and Art, and Prof. Jerzy Remer, Regional Preservationist of Historic Sites. The speeches combined recognition for the activity of the Museum to date and anniversary wishes, highlighting the significance of the donation made by engineer Szulisławski for the future of the Museum. During the final part of the celebration, Szulisławski donated the gift to Mayor Twardzicki, and Dr. Bełza read the special deed of donation. It was the end of the official part of this great event, which was widely reported in local press, just like the donation made years earlier by Franciszka Wyczółkowska. In 1937, Mayor of Bydgoszcz Leon Barciszewski said: “thanks to this generous donation, the artistic name of one of the greatest Polish painters has been inseparably tied to our city.” Activities of the Museum and the Bydgoszcz City Board in both prewar period and later were aimed at providing to the collection a safe place and turning it to an immortal monument of Leon Wyczółkowski’s work.” These efforts have been perfectly highlighted by the response of Mayor Barciszewski to an offer regarding purchase of a Rembrandt’s work. The offer was rejected, justified by the fact that the Museum is focused on acquisition of Leon Wyczółkowski’s works. Zdzisław Hojka, Museum in Bydgoszcz 1923 – 2008. History and Collections, Bydgoszcz 2008, p. 14. National Archives of Bydgoszcz (called later APB), Correspondence between the management of the Museum and representatives of the Municipality of the city of Bydgoszcz with cultural and scientific institutions, social organizations, etc., sign. 73. Ewa Sekuła-Tauer, Collection of Leon Wyczółkowski’s Works [w:] Museum in Bydgoszcz. Catalog of the Exhibition, September 26 – December 28, 2008, Bydgoszcz 2008, p. 63. APB, Correspondence of the management of the Museum, sign.73, p. 54. Dziennik Ostrowski, February 20, 1937, No. 41, p. 1. APB, Stadtmuseum in Bromberg – Sicherstellung (Dezentralisierung von Kulturgut), sign.154. APB, Report on the activity of the Municipal Board of the city of Bydgoszcz for the term between January 1, 1934 and December 31, 1938, sign. 4662, p. 13. Kurjer Bydgoski, April 23, 1937, No. 93, p. 6. From the collections of the Leon Wyczółkowski Regional Museum in Bydgoszcz (later called MOB), Deed of Donation of the works made by Leon Wyczółkowski in 1937, sign. Wb.540. MOB, Copyright Transfer Agreement, sign.Wb.204. MOB, Obligation – an agreement regarding copyrights, sign. Wb.203. 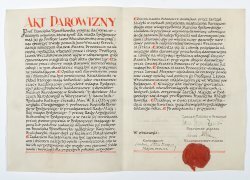 MOB, Franciszka Wyczółkowska’s Deed of Donation with a list of works, sign. Wb.202. Ibid. ; RAK was a cultural organization, which was active in 1934 – 1939. Its members included local artists such as Witold Bełza, Władysław Stoma, Marian Turwid, and Wincentyna Teska. Within its activity, RAK presented works of painters and sculptors in the Municipal Museum of Bydgoszcz. In January 1937, it organized a symposium dedicated to Leon Wyczółkowski. APB, Archives of the Municipal Museum, Municipal Museum Office, sign. 189/4187, p. 42. Ibid, sign. 189/4187, p. 43-44. APB, Resolutions of the Municipal Office dated between June 5, 1937 and May 2, 1938, sign. 3018, p. 9. Selection of the date was intentional, since Leon Wyczółkowski was born (according to the Julian calendar) on April 11, 1852. Kurjer Bydgoski, April 13, 1937, No. 84, p. 6. APB, Resolutions of the Municipality, sign. 3018, p. 9. APB, Bydgoszcz City Board, Archives of the Municipal Museum, 1945 – 1948, sign. 562, p. 145. Kurjer Bydgoski, July 6, 1937, No. 151, p. 6. Barbara Chojnacka, History and Architecture of the Old Orphanage – “Borderland Dormitory” in Bydgoszcz, 32 Chodkiewicza Street [w:] Materials to the History of Culture and Art of Bydgoszcz and its Environs, booklet 2, Bydgoszcz 1997, p. 64. APB, Archives of the Bydgoszcz City Board, Dr. Łepkowski Edward, Director of the Municipal Museum, sign. 189/3138, p. 195. Catalog of Gifts Donated by Prof. Leon Wyczółkowski’s Wife, Prof. Konstanty Laszczka and Chairman Kazimierz Kierski, Bydgoszcz Municipal Museum, July-September 1937. APB, Archives of the Bydgoszcz City Board, Dr. Łepkowski Edward, Director of the Municipal Museum. MOB, Kazimierz Szulisławski’s correspondence with Dr. Julian Fiut, sign. Wb.1054-2. APB, Lists of historical objects prepared by the Germans to take to nearby manor houses, sign. 163.
in Bromberg – Sicherstellung, Correspondence 1939 – 1944, sign. 154, s. 195. Based on APB, List of movable historical objects (Searching, securing and bringing museum collections as well as lists of losses. Purchase of artworks), sign. 189; From the analysis of the mentioned documents we can find out that some works were listed twice, e.g. Zakopane – Gubałówka (W.50) shown on the list of objects taken to Piotrkówko on 21.10.1943 and 3.03.1944. APB, List of movable historical objects, p.5. APB, Bringing back artworks and historical objects after World War II, p. 9-11. APB, List of movable historical objects, p.15. APB, Bringing back artworks and historical objects after World War II, p. 13. APB, List of movable historical objects, p. 25-26. List made based on the deposit takeover certificate, MOB, Correspondence between Kazimierz Szulisławski and Dr. Julian Fiut of Krakow, sign.Wb.1054-2; The inventory of deposits contains a note about the takeover of the painting Prof. Rüdiger… by Dr. Fiut, although there is no information about the date of this event. APB, Stadtmuseum in Bromberg, sign. 154. MOB, Memories of Mr. Trawa and Bolcek about Franciszka Wyczółkowska, sign. Wb.1067. MOB, Letters of Franciszka Wyczółkowska to K. Szulisławski, handwritten and typewritten, sign. Wb.1049. Ibid, sign. Wb.1051, Wb.1050, Wb.1047, Wb.1048. MOB, Memories of Mr. Trawa, sign. 1067. MOB, The Last Will of Franciszka Wyczółkowska, sign. Wb.997. MOB, Memories of Mr. Trawa, sign. Wb.1067. Kurjer Bydgoski, April 13, 1937, No. 151, p. 6. APB, Bydgoszcz City Board, sign. 7, s. 59. Ibid; In February of the same year, Kazimierz Borucki sent to Dr. Bełza, Head of the Department of Culture and Arts a letter, in which he reminded about the plans of naming one of the Bydgoszcz streets after Wyczółkowski, which the municipal authorities wanted to implement after receiving the donation from Franciszka Wyczółkowska. 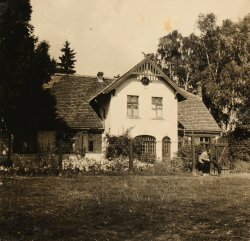 At that time, they had in mind the stretch between 20 Stycznia 1920 Street and Adama Mickiewicza Avenue, APB, Bydgoszcz City Board, Archives of the Municipal Museum, p. 58. MOB, Invitation to the Solemn Opening of the Leon Wyczółkowski Municipal Museum, sign. Wb.754. APB, Bydgoszcz City Board, sign. 562. Ziemia, September 4, 1948, p. 5. Kurjer Bydgoski, April 13, 1937. APB, Archives of the city of Bydgoszcz 1920-1939, Correspondence with Leon Barciszewski 1936-1939, sign. 189/3009. Based on a list prepared by Dr. Konrad Kothe, APB, Stadtmuseum in Bromberg – Sicherstellung, Correspondence, p. 221 – 256. According to the list of museum exhibits taken from the Municipal Museum during World War II prepared by Kazimierz Borucki, APB, List of movable historical objects, p. 27 – 30, 37 - 53. The list includes a handwritten note dated May 24, 1949, “partially damaged,” APB, Stadtmuseum in Bromberg - Sicherstellung, Correspondence, p. 221. A note from the inventory of deposits: “Stadtsparkasse Brg. Returned on September 27, 1948 L.dz.410/48”.